Uterine fibroids are growths of non-cancerous tissue on the lining of the uterus. The growths can range from the size of a pea to five inches in diameter. Although they are not harmful, they can cause significant pain. According to the American College of Obstetricians and Gynecologists, treatment most often includes hormonal medications and surgery. 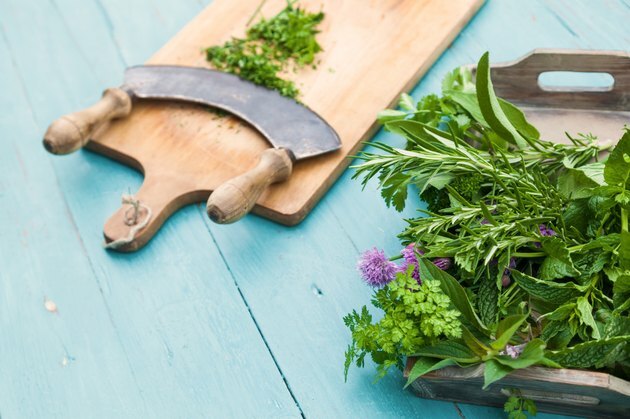 Although science does not present much evidence for the use of herbs instead, many women prefer such natural treatments. Always consult with your doctor before using herbs, especially if you are also taking other medicines, or are trying to conceive or breastfeeding. According to the herbal website MotherNature.com, vitex, also known as chaste-tree berry, can help to slow the growth of fibroids. Vitex may also help to dissolve existing fibroids and prevent the development of new ones. Vitex is used to treat many female reproductive concerns and is believed to balance female hormones. According to herbalist Susun Weed, herbs to strengthen the liver can help the body metabolize estrogen more efficiently, thus reducing the frequency and intensity of uterine fibroids. Weed recommends using yellow dock root, dandelion and milk thistle seed to strengthen the liver. Herbs to clear the lymph system may also reduce the size and incidence of uterine fibroids. MotherNature.com recommendations include using herbs such as ginger, mullein, prickly ash bark, cleavers and burdock. Combining all of these herbs in a tea may be easier than swallowing several supplement pills. Traditional Chinese Medicine, or TCM, is a complex system of treatments, including herbal medicine, acupuncture, dietary changes and a belief in the body's energy systems. The TCM theory regarding uterine fibroids is that the condition is caused by too much cold in the body, which is linked to spleen "qi", or energy. Herbal treatments to boost spleen qi, according to the website Ageless Herbs, include hawthorn fruit, fu ling fungus and marshmallow root. Ayurveda is an ancient, traditional form of Indian medicine, in which the individual characteristics of people are grouped into one of three basic doshas. According to the Ayurveda Seminars website, ayuvedic medicine views uterine fibroids as an imbalance of the doshas, and particularly an excess of kapha. Treatment includes eliminating causative factors, such as sleeping during daylight hours, eating after seven p.m., excess food and insufficient exercise. Psychological and emotional treatment is also recommended, especially regarding any unresolved issues surrounding motherhood.